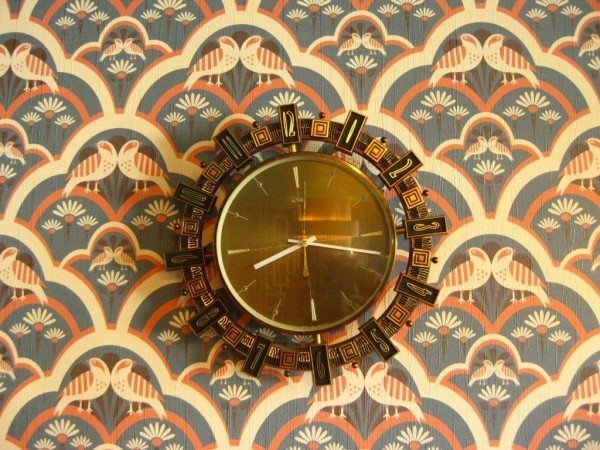 Did Somebody Say Eighties Kitsch? 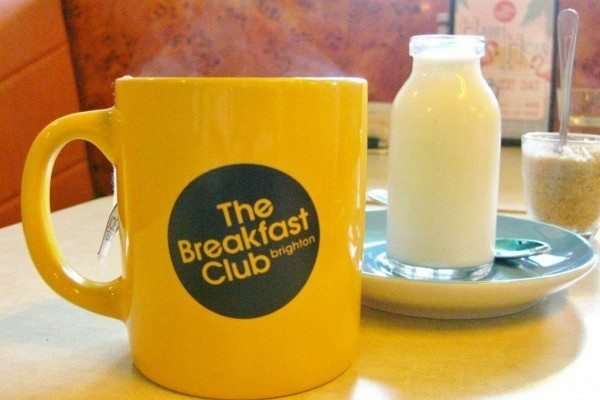 Well you can find it in spades at The Breakfast Club cafe in the bustling Lanes in Brighton. The name of the game is full-on immersion in the past and, whether you love it or hate it, you have to admire their dedication to the theme. 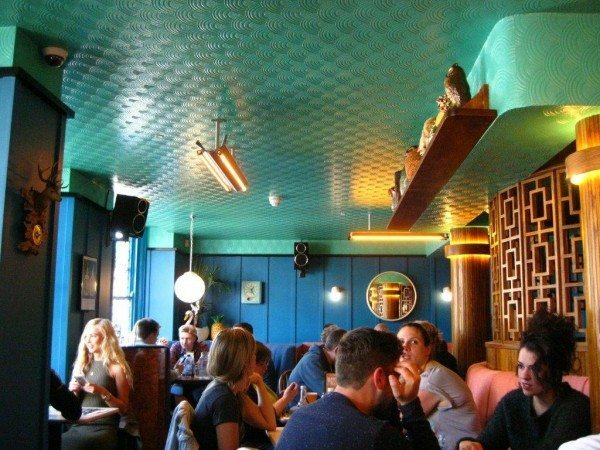 The décor is a joyful assault on the senses, combining an outrageous aquamarine “faux” Artex ceiling, spectacularly lurid patterned wallpaper, startling blue, orange and yellow paintwork, lots of wood detailing and a healthy smattering of garish knick knacks and memorabilia. 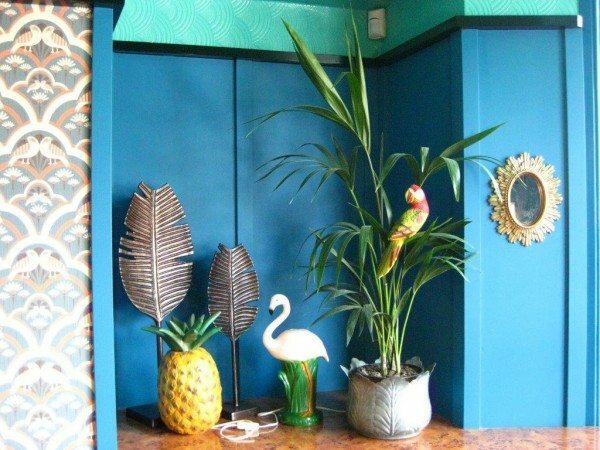 Pink plastic flamingoes, stag head wall clocks and pineapple lighting, it’s all here. And the music? Well eighties pop of course. Don’t be surprised if it triggers the odd spontaneous sing-along from a nearby forty-something. 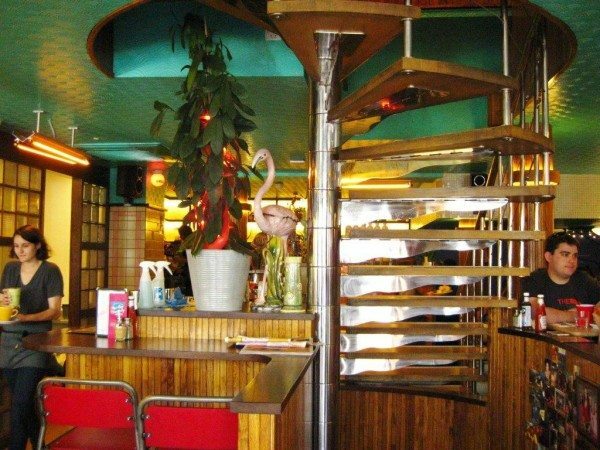 So if you’re after a nostalgic stroll down memory lane while you dine, this is undoubtedly the place for you. 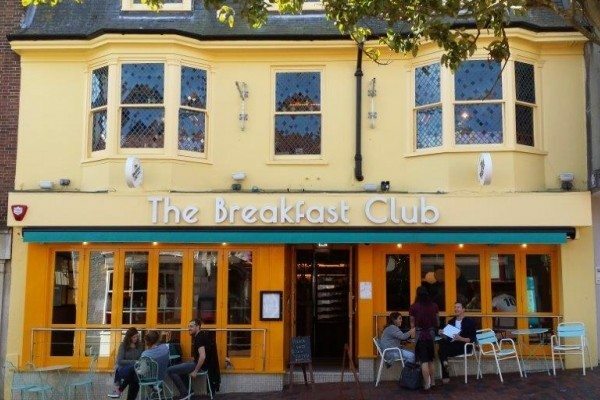 The fun-loving folk who instigated the Breakfast Club phenomenon (who I like to think wear leg warmers and bat-wing jumpers in their spare time) set out on a mission to provide us with hearty grub while immersing us in eighties pop culture and, I think it’s fair to say, it’s gone down a storm. 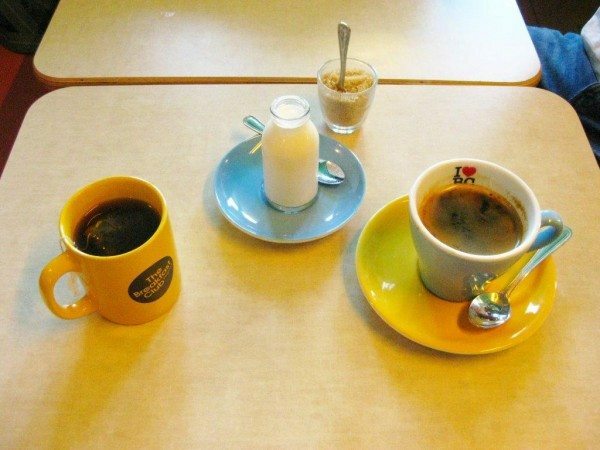 They started out from humble beginnings in 2005 in London’s Soho and have since expanded into a successful eight cafe empire, Brighton being their latest addition. Aside from keeping us well-fed and reminding us of our misspent youths, they are also involved in a good number of charitable projects that you can read all about on their website, which is itself a whimsical nod to the universally beloved, blocky computer games of the era. The Breakfast Club is obviously very popular. We arrived at 11′ o’clock in the morning and all the tables were already full. By the time we left, a considerable queue of hungry hopefuls had built up outside. The service was warm and friendly and provided, I couldn’t help but notice, entirely by folk far too young to even remember the eighties, bless ’em! We ordered a tea and a coffee and decided to share a chocolate milk shake on the side. The tea and coffee were great and I liked the fact that the tea came in an honest to goodness mug. The milkshake was very milky and sweet so I was glad we were sharing as I wouldn’t have managed a whole one on my own. 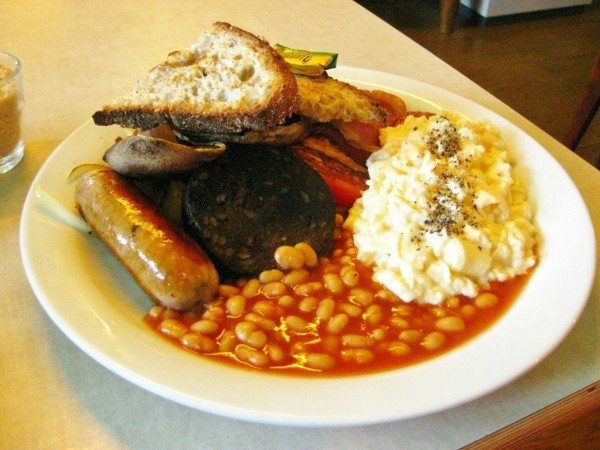 For brunch Andrew went for the Full Monty, which is basically your traditional full English. I fancied trying something a little different so I went for the Huevos Rancheros, which translates as rancher’s eggs and is a Mexican-style breakfast. It all arrived hot, on clean plates and the portions were very generous. Andrew’s Full Monty came with bacon, sausage, black pudding, eggs, home-style fried potatoes, mushrooms, beans, grilled tomato and toasted multi-grain bloomer. The bacon was properly crispy and the sausage was a large, perfectly cooked, good quality, high pork content, beast of a banger. The huge disc of rich, soft black pudding was well-cooked and the vast dollop of scrambled eggs was well-seasoned and soft but not runny. The mushrooms were grilled, so not at all greasy, the tomato was juicy, the toast was crunchy and the beans were nice and saucy and not over-cooked. The fried potatoes were a lovely addition and came with fried onions, which made for a delicious combination. Andrew really enjoyed it. My Huevos Rancheros came with fried eggs, tortilla with melted cheddar, refried beans, chorizo, salsa, sour cream and guacamole. The fried eggs were a perfect “sunny side up” and sat on soft, earthy refried beans, which had a decent kick of chilli heat. 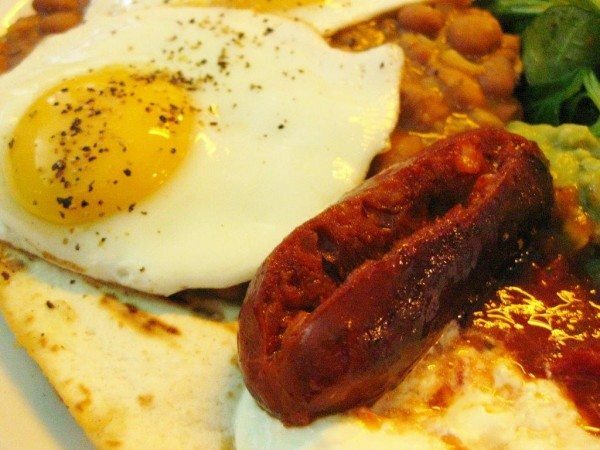 Underneath that, the breakfast carbs were provided by the warm, cheesy flour tortillas and in pride of place were two glistening, red, whole chorizo sausages, which were rich and meaty and zingy with spice. The cool sour cream and smooth, creamy guacamole ware there to calm your taste buds and the juicy salsa and handful of lamb’s lettuce acted as a palate cleanser. It was so much food that, despite my best efforts, I couldn’t actually clear my plate. We sat and digested while we finished our drinks and listened to one final eighties classic then walked out into the Brighton sunshine, absolutely stuffed and with a serious case of Rick Astley ear worm.